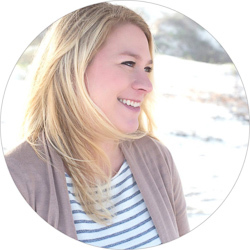 Well, we’ve now got ourselves a one year old and have to say “toddler”, which is sad because technically I no longer have a baby, but also sad because “toddler” has sooo many assumed frustrations and connotations and it scares me, ha. Luckily we’re still doing pretty good and Connor is quite the happy little dude who has something new to show us almost every day it seems like. So, total shocker I know, his party theme was “vintage nautical”. I thought about a pirate or fishing theme at first but really just wanted to do a basic less-kid theme while I could so I brought it down to just “vintage nautical”. Navy, white, gold, light blue, and kraft brown/wood were the main colors with touches of red here and there. 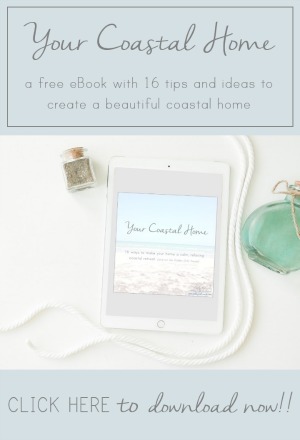 Luckily this theme blended right in with our coastal/nautical decor so we already had a bunch of the accent items around the house to use. 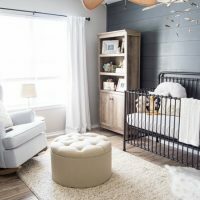 I do admit, I kind of wanted to leave a bunch of this stuff up all the time because it looked so cute in our house :) Sources are linked at the end of the post in case you’re party-shopping too! I apologize for the not so great iPhone pics, I had like 20 minutes before guests arrived to snap pictures, eek! 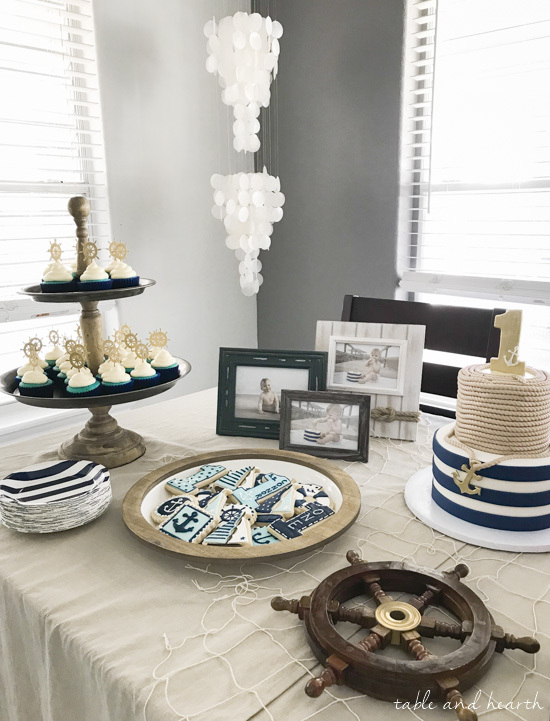 Welcome aboard to Connor’s Vintage Nautical first birthday party!! Our front entry still isn’t my favorite space but it already had some nautical charm with our doormat so I just hung a life preserver with the “Welcome Aboard!” sign on the door like a wreath and put the two balloon clusters on each side. 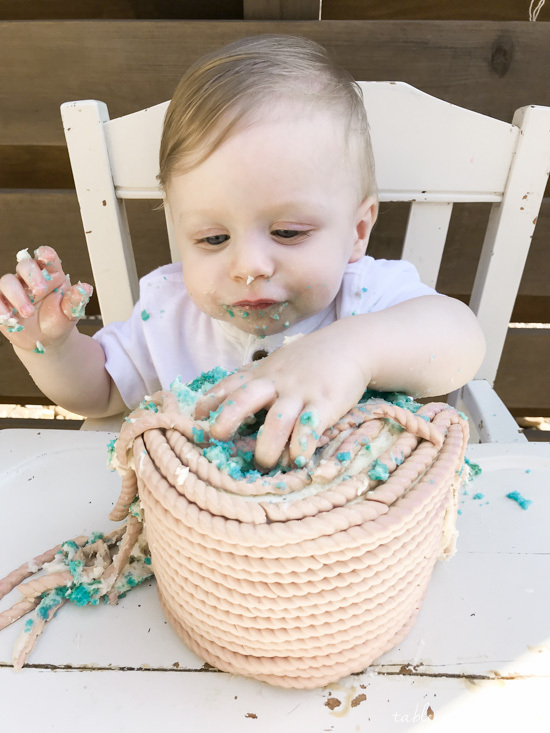 I had originally planned for them to go on each side of his high chair during the cake smash but our 30mph winds made me go to Plan B. I used some monkey’s fist rope doorstops we have to use as balloon weights. Our entry table became the favor table, with a distressed white “C” and a tub with all the favor bags. I went a little crazy with the fish net around the party but just LOVED the way it looked everywhere so I couldn’t stop. 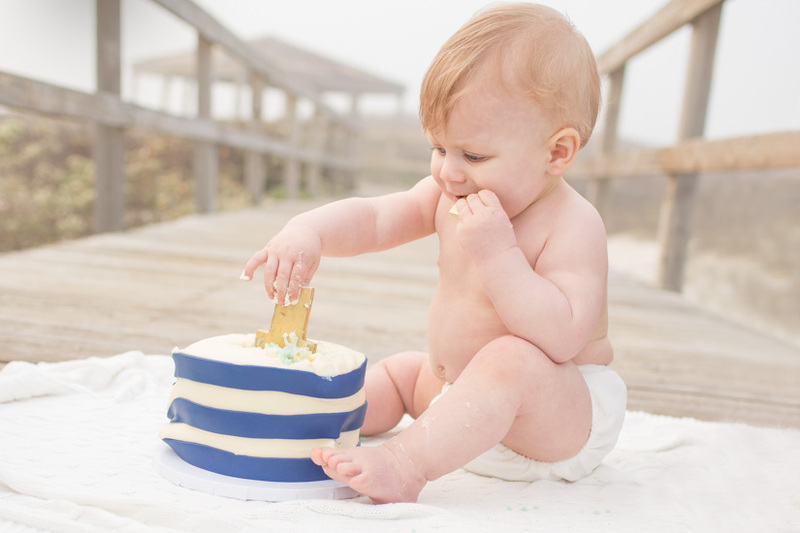 A few weeks before the party we had a cake smash photo session with our favorite photographer out at the beach so that we’d have some cute pictures to put around his party. The favor bags had a handful of sea critter bath toys, a gold plastic bottle of bubbles, and one of the yummy cookies. I really wanted to have personalized bags and these fit the theme perfectly! Probably my favorite piece of decor for the party was his monthly photo display. I hung the net (again) on our mantel and clipped all of his monthly pictures on it with some circle numbers I made from Etsy. Seeing all of them together sure made all that time battling him to take those pics worth it :) I reallllly wanted to leave this up! Our dining table became the cake/food table with a spread of blue velvet cupcakes, cookies, and his party cake as well as sandwiches from Jimmy John’s catering. I wanted to keep this easy on us so I brought food in instead of cooking which worked out awesome and the sandwiches (Mini Jimmy’s) were a hit. The sweets were all made locally by The Sweet Chic-a-Dee and are DELICIOUS so if you’re local and looking for some treats hit her up, she’s done two other of our friends’ birthday parties too :) The cookies were my absolute favorite, they came out adorable and I loved the “SS Connor” she put on a few. I didn’t want to mess with cutting any cake (hence the cupcakes) but still wanted a tiered cake so the bottom striped part is just a dummy, then the top rope part was another little smash cake that we just popped off when it was time to do that. The main hangout spot was our backyard though where I rented a few tables and chairs for the yard in addition to our patio seating so everyone had a place to sit and chill. The weather was great but it was probably the hottest day we had had so far (85ish) so I was glad when the tree shade crept over the tables halfway through the party. At least it didn’t rain! I have been scouring Craigslist and FB Marketplace since last summer looking for a vintage wooden high chair to use for his party and last fall this PERFECT white chippy number popped up a couple hours north of here and I headed up to get it as soon as I could. I know it’s pretty ridiculous to hang onto a wooden highchair you used once at a party but I seriously cannot get rid of this thing, it’s just too cute! When he finally decided to wake up from his nap an hour into his party, the birthday boy got to see so many friends and family, played his little heart out with other kiddos, and had a good time digging into his smash cake. 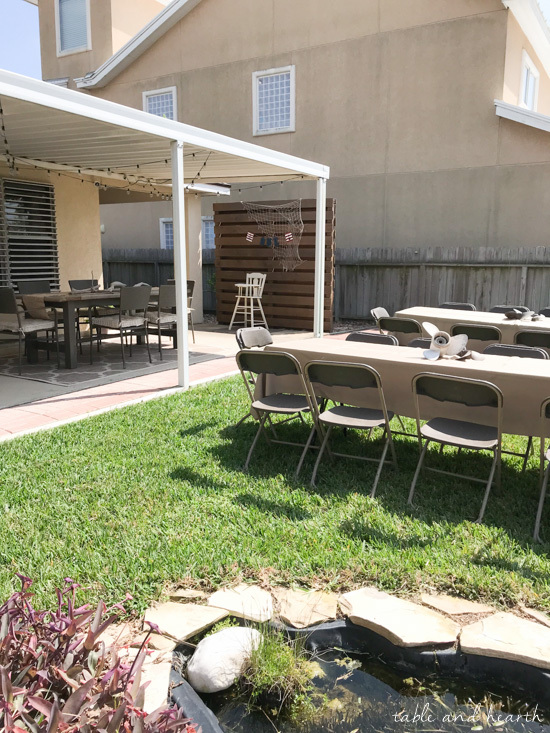 We were thrilled with how well everything came together for his party and were so happy that so many of our friends and family could make it over to celebrate with us. We know about six babies who all turned 1 this month so it’s been a first birthday party-palooza around here and I get choked up at every single one when we sing happy birthday. This has been the most surreal year, filled with all sorts of emotions and not always easy, but I seriously can’t picture our family without little C.P. in it. 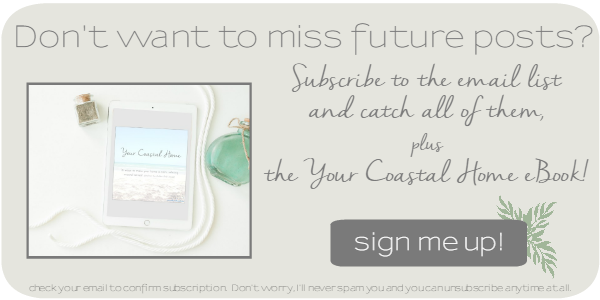 Here’s to the next crazy year of toddlerhood, eeek!! !